Bajram Rexhepi (born 3 June 1954) is a Kosovar politician who is the former Interior Minister of the Republic of Kosovo and a member of the Kosovo Assembly. He was also the first elected post-war Prime Minister of Kosovo. He is a member of the second largest political party in Kosovo, the Democratic Party of Kosovo (PDK). Rexhepi was born in Mitrovica, Province of Kosovo on 3 June 1954. He graduated from the University of Prishtina and completed his postgraduate studies at the University of Zagreb in 1985. 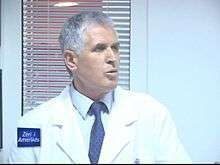 Rexhepi spent most of his career working as a surgeon and achieved fame as the best surgeon for circumcisions in the Mitrovica region. During the 1999 Kosovo War, Rexhepi joined the Kosovo Liberation Army (KLA) and spent three months serving as a field doctor. He served as mayor of the Albanian section of Mitrovica, working with United Nations and NATO peacekeepers to implement ideas to diminish the civil unrest. As Serbs and Albanians had broken off all dialogue, Rexhepi offered to give up his position in favour of a UN administrator, but Serbs rejected this proposal. ↑ "Bajram Rexhepi - Prime Minister of Kosovo". Setimes. Archived from the original on 13 February 2010. Retrieved 28 January 2010.